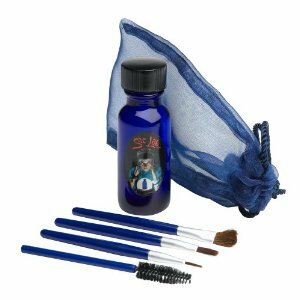 She Laq is a clear liquid solution designed to be put on the top of any makeup to help it last longer without smudging or fading. There is also a brush attached to the lid of the solution. This can be used to put the liquid onto the application brushes, so not too much is used and the solution will stay clean. Benefit do advise that all the application brushes need to be cleaned after each use to stop contamination. Water, SD Alcohol 40-B, Acrylates/Octylacylamide Copolymer, Triethanolamine, Propylene Glycol, Methylparaben, Propylparaben, Imidazolidinyl Urea. Dip a clean brush into she-laq and apply over makeup to seal it on. Allow to dry completely for about 1-2 minutes before touching. Wash brushes after each use and store in pouch. Most patrons using She Laq found it helped their makeup last longer without smudging and think its a little pricey at $30 but worth it as it last a long time. Some ladies think its an average product that works well for eyeliner but nothing else. They also found that it was a little difficult to use, as if too much lacquer is used it looks a little plastic and makes the skin feel tight. This may not be the easiest product to use but when you get the hang of it like many have, it seems to work for most people.